You must have driven past Anna Salai at least once but did you know that this well-known landmark of Chennai houses more than 15 indoor lighting stores? Well, we went to all of them and here are our favourite. Looking for special lights for your house or office? They have them all. Specific lights for your ceiling, the one that can be hung, wall lights, all starting from INR 300. Lanterns and chandeliers with intricate detailing are available, starting from INR 5,000. We loved this Amoeba-shaped chandelier and this quirky mix of fan and light! With more than ten different types of lights including street, ceiling, office, hanging, bottle lights, lamps and shades, chandeliers, and traffic lights, this place has a great collection. The bottle lights and small lamps start at INR 500 while the high-end LED-lights start at INR 5,000. This hanging light and chandeliers caught our attention! 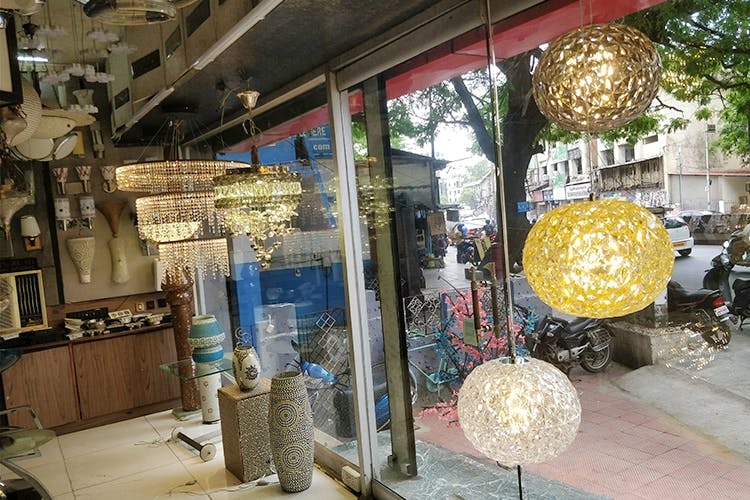 This store has a good collection of hanging lights starting INR 500. They also have office lights and ceiling lights starting at INR 700. What's the best part? The prices are negotiable! You cannot ignore this chic round-tape light! For all things simple and elegant, this store is the best. We really recommend their wall lights that stand out for their unique designs. Do check out their wooden and glass lamps starting at INR 500. Our fave was this vintage wooden light! Looking to jazz up your bedroom? Their paper lanterns starting from INR 450, will not disappoint you. Portable and quirky office lights caught our eye and are available from INR 700.